Its scope and strategies for its reduction. For all of these reasons, poor adherence to prescribed topical IOP-lowering therapy is a problem but certainly not a new one. Kass and colleagues informed the glaucoma community about it more than 30 years ago in classic studies using electronic monitors within eye drop bottles.4,5 Nevertheless, clinicians did not hear much about adherence (often termed compliance) until about 15 years ago, when Tsai and colleagues published their taxonomy of factors influencing adherence.6 A few year later, I participated in an American Academy of Ophthalmology committee tasked with soliciting ideas from patients that they themselves used to maximize their own adherence. We awarded prizes for the best suggestions during the Academy’s annual meeting in Las Vegas in 2006. •Missed doses, lapsed refills, inaccurate drop administration—poor adherence to topical glaucoma therapy is a well-established problem. •One possible solution is to improve adherence through techniques such as reminders. Others are controlled-release drug delivery and the use of nonmedical means of lowering IOP. •A key factor is better identifying which patients are not using medical therapy as prescribed. Since then, many studies have documented missed doses, lapsed refills, and eye drops that have missed their intended target. As one would expect, these studies of various designs, performed in diverse populations, and using different definitions of adherence produced a range of estimates of the problem’s scope. Recently, researchers reported an adherence rate (defined as the use of the eye drop within 4 hours of the designated time on at least 75% of days) of 82% for prostaglandin monotherapy.7 Not only is this a lenient definition of adherence, but the actual figure is likely to be lower for two reasons. First, patients in the real world are not being monitored. Second, patients who are using more than one topical medication are likely to be less adherent than those on once-a-day monotherapy.8 Unfortunately for clinical practice, physicians are poor at identifying which patients are using eye drops as prescribed and those who are not. So, what can be done to solve the problem of poor adherence? Colleagues of mine at the Wilmer Eye Institute have conducted clinical trials using education and reminders, and they have demonstrated that such interventions can improve adherence.9 Unfortunately, the effect is modest. More importantly, these studies were short term, so it is unknown if the beneficial effect persists (after the intervention has ceased). 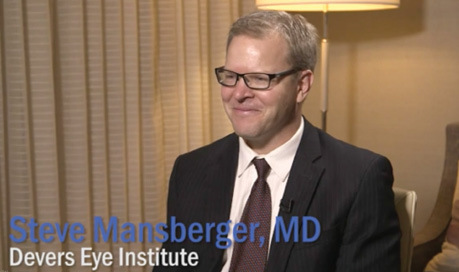 Steven Mansberger, MD, MPH, and Steven Vold, MD, discuss how to improve patients’ adherence to prescribed glaucoma therapy in this episode of Glaucoma Today Journal Club. A third option is to use nonmedical means to lower IOP. Laser trabeculoplasty has been around for decades, has a great safety profile, and definitively eliminates the issue of adherence. Unfortunately, trabeculoplasty often does not lower IOP enough to eliminate the need for eye drops, and even when it does, many of those patients will eventually need to resume topical eye drop therapy. 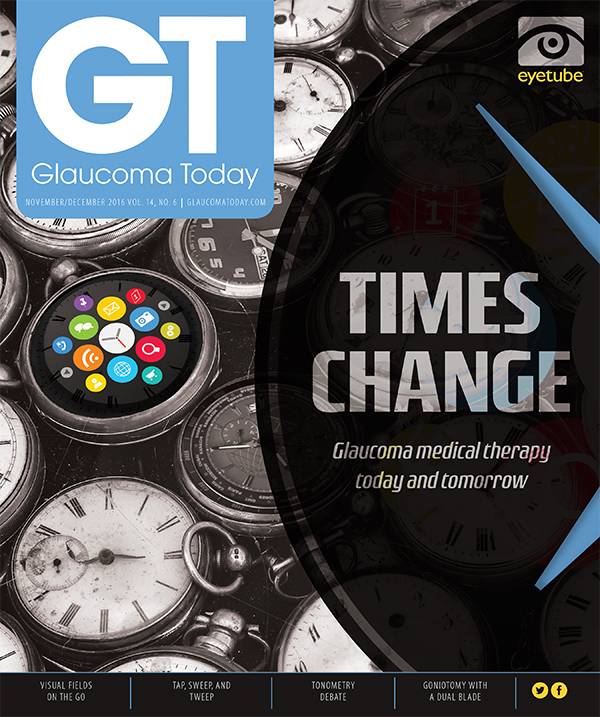 The concept of performing trabeculectomy to avoid medical therapy was rigorously tested in the Collaborative Initial Glaucoma Treatment Study (CIGTS) 20 years ago, but the side effects of the procedure preclude widespread adoption of this approach. Perhaps microinvasive glaucoma surgery can play a role in nonadherent patients in whom cataract surgery is indicated. In that case, better identification of patients who are not adherent would be desirable to avoid the performance of a glaucoma procedure on patients who really do not need it. 1. Lee PP, Walt JG, Chiang TH, et al. A gap analysis approach to assess patient persistence with glaucoma medication. Am J Ophthalmol. 2007;144:520-524. 2. Quigley HA, Friedman DS, Hahn SR. Evaluation of practice patterns for the care of open-angle glaucoma compared with claims data: The Glaucoma Adherence and Persistency Study. Ophthalmology. 2007;114:1599-1606. 3. Hennessy AL, Katz J, Covert D, et al. A video study of drop instillation in both glaucoma and retina patients with visual impairment. Am J Ophthalmol. 2011;152:982-988. 4. Kass MA, Meltzer DW, Gordon M, et al. Compliance with topical pilocarpine treatment. 5. Kass MA, Gordon M, Morley RE Jr, et al. Compliance with topical timolol treatment. Am J Ophthalmol. 1987;103:188-193. 6. Tsai JC, McClure CA, Ramos SE, et al. Compliance barriers in glaucoma: a systematic classification. J Glaucoma. 2003;12:393-398. 7. Boland MV, Chang DS, Frazier T, et al. Electronic monitoring to assess adherence with once-daily glaucoma medications and risk factors for nonadherence. JAMA Ophthalmol. 2014;132:838-844. 8. Robin AL, Novack GD, Covert DW, et al. Adherence in glaucoma: objective measurement of once-daily and adjunctive medication use. Am J Ophthalmol. 2007;144:533-540. 9. Okeke CO, Quigley HA, Jampel HD, et al. Interventions improve poor adherence with once daily glaucoma medications in electronically monitored patients. Ophthalmology. 2009;116:2286-2293. 10. Chang DS, Friedman DS, Frazier T, et al. Development and validation of a predictive model for nonadherence with once-daily glaucoma medications. Ophthalmology. 2013;120:1396-1402. 11. Fu J, Sun F, Liu Y, et al. Subconjunctival delivery of dorzolamide-loaded poly(ether-anydride) microparticles produces sustained lowering of intraocular pressure in rabbits. Mol Pharm. 2016;13:2987-2995. 12. Brandt JD, Sall K, DuBiner H, et al. Six-month intraocular pressure reduction with a topical bimatoprost ocular insert: results of a phase ii randomized controlled study. Ophthalmology. 2016;123:1685-1694.